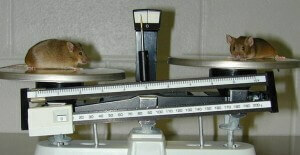 Scientists have disabled a single gene to mimic the benefits of Caloric Restriction in mice. We’ve known for a while that severely limiting your dietary intake, while somehow still managing to get all your necessary nutrients, can extend lifespan dramatically. Caloric Restriction (CR) can increase a mouse’s lifespan by about 50%. Of course, no one wants to eat less so scientists have been pursuing other avenues to achieve CR benefits. We’ve told you about one such possible route: the use of resveratrol, which may (or may not) work. A recently published article in Science discusses another. Dominic Withers from the University College of London extended the lifespan of female mice by 20% using a technique to disable one of their genes. Not only did these mice live longer, they showed greatly improved health at middle age. Withers and his associates may have discovered a genetic fountain of youth. Life extension has a lot of advocates, notably the Methuselah Foundation and Aubrey de Grey whom we discussed earlier. Most would agree that we need two types of approaches to achieving longevity: a technique that could be applied to people who are already old, and a technique that could be applied from birth or earlier. Withers’ genetic manipulation would be one of the latter. With a single genetic tweak, humans conceivably could be modified in vitro to live longer and healthier. Furthermore, that tweak could become germline (that is, passed on to offspring) so that all future generations of humans had the same longevity. Withers’ work could be the start of a new era of humanity. There are several competing theories of why CR works, but most focus on interactions between key proteins and cell metabolism. One such protein, mTOR (mammalian target of rapamycin) acts to determine levels of nutrients in the body and helps regulate the body’s response. A study published this July in Nature showed that CR benefits could be generated in mice by dosing them with the drug rapamycin (for which mTOR is named). That’s really exciting. Think about it, life extension just by taking a pill. However, rapamycin causes suppression of the immune system in humans – it is used during organ transplants – and would be unsuitable for use in extending your life. Don’t worry, we’re not done yet. By studying mTOR’s chemical pathways scientists found another protein, S6K1, and its related gene. It was this gene that was targeted in Wither’s research. He and his colleagues ‘knocked out’ the gene from a group of mice. Essentially that gene was disrupted so that it would not be expressed. The knockout mice displayed some amazing health at 600 days (middle age for a mouse). They had stronger bones, better insulin sensitivity, healthier immune cells, and improved coordination in cognitive tests. Essentially, they had the skills of younger mice. Female knockout mice lived 20% longer. Unfortunately, the male knockout mice did not. While they displayed the same benefits at middle age, the S6K1 disruption did not grant them longevity. The research team doesn’t know why. However, they have identified other genes and proteins that could be explored to see if more CR benefits could be achieved through genetic manipulation. One protein, AMPK, might yield CR results and it already has a prescription drug associated with it: metformin (used to treat type 2 diabetes). It is unclear if or when we will start genetically manipulating humans in vitro, but with research like this, that day is more certain to come. A single tweak that could extend life by 20% and let middle aged people feel like teenagers? Parents would be clamoring for the treatment. Longevity in general, whether it comes from a pill, a genetic treatment, or an improved lifestyle, is likely to interest humanity more and more as our population continues to age.